growing up in an artificial community of young soldiers Ender suffers greatly from isolation, rivalry from his peers, pressure from the adult teachers, and an unsettling fear of the alien invaders. His psychological battles include loneliness, fear that he is becoming like the cruel brother he remembers, and fanning the flames of devotion to his beloved sister. Is Ender the general Earth needs? But Ender is not the only result of the genetic experiments. The war with the Buggers has been raging for a hundred years, and the quest for the perfect general has been underway for almost as long. Ender's two older siblings are every bit as unusual as he is, but in very different ways. Between the three of them lie the abilities to remake a world. If, that is, the world survives. (1990). 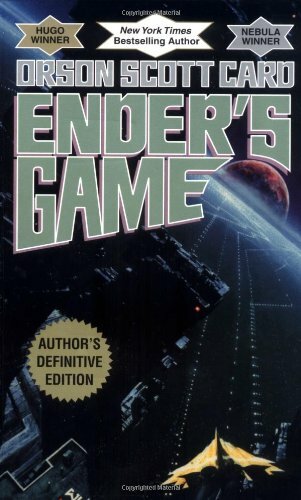 His novel Ender's Game and its sequel Speaker for the Dead, both won Hugo and Nebula awards, making Card the only author to win both prizes in consecutive years. His titles Shadows in Flight, Ruins and Ender's Game made The New York Times Best Seller List. He is also the author of The First Formic War Series, which includes the titles Earth Unaware, Earth Afire, and Earth Awakens.